i know, i know, i know...i couldn't resist. what can i say? i can't control myself. there it was, just hanging out in the bathroom...like it was waiting, for me. 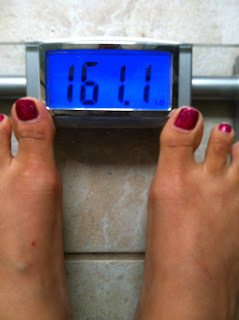 and to my surprise, i lost 1 pound...since tuesday! the bacon, the milk, and a little extra cheese here and there keep me sane and satisfied. i'm sure i would see the numbers drop faster if i skipped them. i know the menu is a bit redundant, but it's only temporary. salsa is my sidekick. it turns bland, colorless, slimy egg whites into tasty, vibrant, clouds of goodness. a friend heard of my salsa obsession during these times of deprivation. so, she sent me the most wonderful, thoughtful gift straight from sunny san diego. it was four bottles of "pico pica"...quintessential california hot sauce. many thanks to my dear friend! turns out we were working out a little to much. no wonder we were so wiped out. less sets, less reps and only twice a week...that's the way to go. i shocked at the muscle i've built in a matter of weeks. it's pretty cool! so, we workout monday and thursday. monday is shoulder press and squats. thursday is dead lifts and bent over row. i do 3 sets of 5, and increase the weight each set. by the last set i'm pretty close to maxing out the weight. that basically means getting the weight as heavy as possible, but still able to finish the last set. i also squeeze in a few walks around the block and playtime at the park with the kiddo. can't weight for next week's weigh-in...hehe!